Very Very Vicky: Relax And Watch The World Go By! Relax And Watch The World Go By! This is one of Tybee's original raised cottages so the front porch is on the upper level. We changed out the exterior light fixtures and painted the front door a beautiful aqua blue. 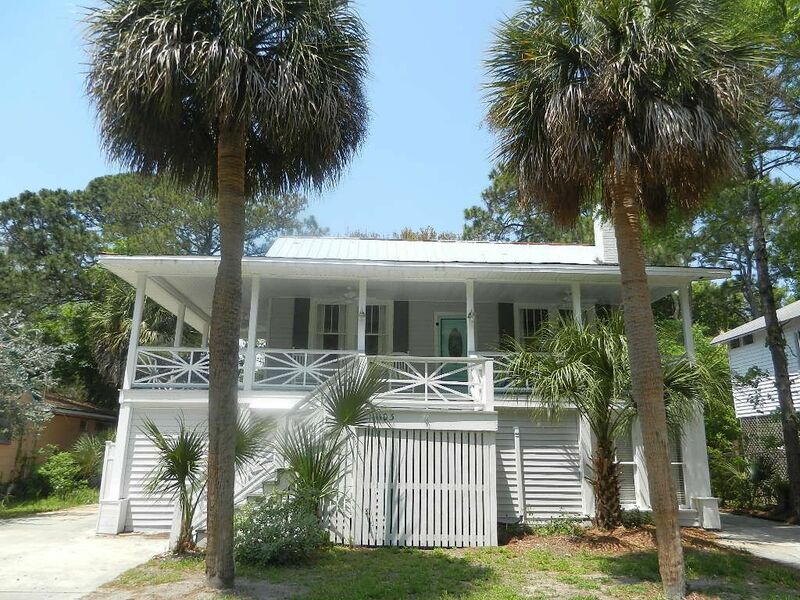 The flimsy lattice was removed from the front and "Tybee-style" boards were put in it's place. New white ceiling fans were also installed. 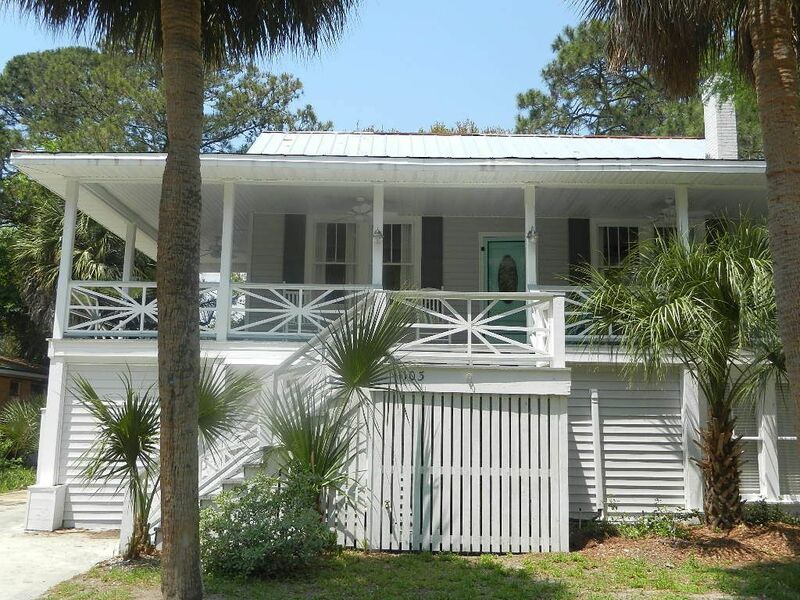 The porch is deep and goes all the way across the front of the house and from front to back on one side! It's a fabulous spot where you can relax and watch the world go by! When I saw this turquoise rattan furniture on sale at Kirkland's website last fall I knew it would be perfect for the front porch! It's quite comfortable. And the outdoor pillows that Jane Coslick and I found at Home Goods are just right! We had a severe storm with high winds a few weeks ago and it blew my little lamp over and broke it--I need to see if I can repair it or get a new lamp for this spot. I just love the feeling of being in an outdoor room that you get when there's a lamp! There's something so restful, comforting, and homey about rocking and visiting on the front porch, isn't there? 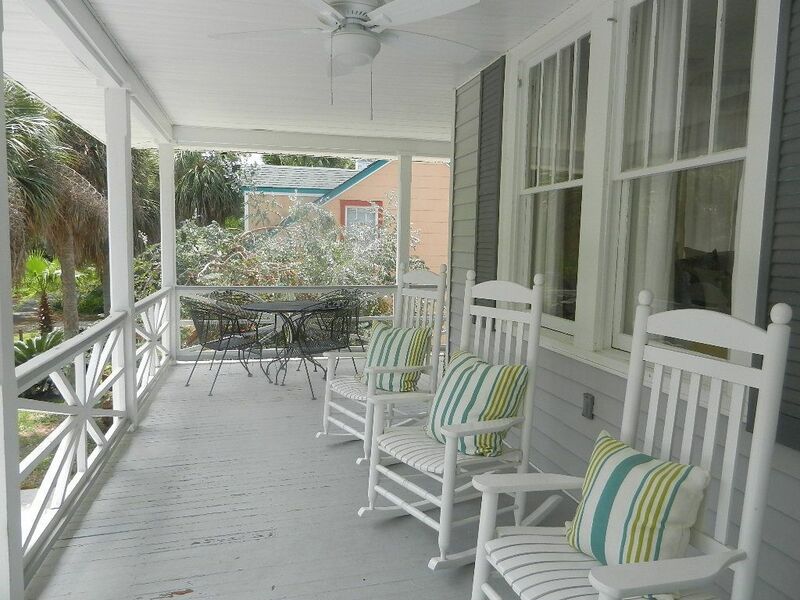 We lined up three white rockers and our guests love to sit here! These pictures make me want to sign off with the sign off used each week by The Beverly Hillbillies TV show of years past (reruns are still being shown aren't they? )...They would always say "Come on in, have a seat, take your shoes off, y'all come back now, y'hear?" So that's where the rattan furniture went! I kept trying to find it in the pictures of Coral Cottage! 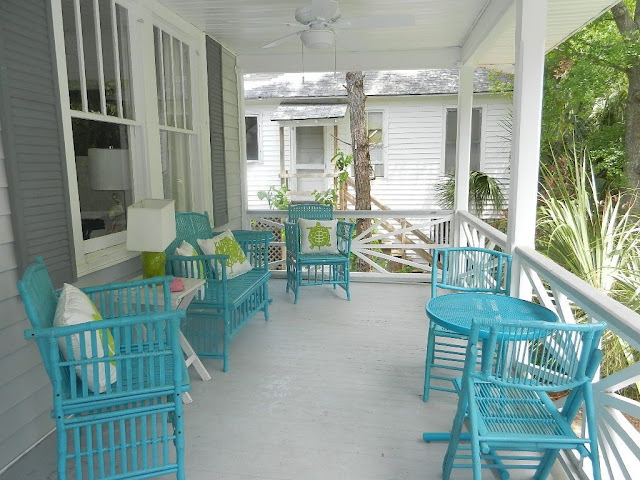 The porches are so relaxing looking and love those pillows. I can't wait to see the inside. Your projects are amazing and so fun. I know your guests hate to leave! I know I would. Thanks Janet! When I saw that rattan on Kirkland's website I knew it would be perfect for the covered porch at Coast Awhile Cottage! I just wish they still stocked it--I'd love to get some for Doc Holiday! Doc Holiday Update: Against The Grain! Have A Nice Glass Of Milk! BEFORE: Beautiful But Not Beach-y! Doc Holiday Gets Its "Skin"! Our Cottages Featured On House of Turquoise! Ready, Set, Go! Racing to Finish! No Guts ~ No Glory!